During social interaction, both participants are continuously active, each modifying their own actions in response to the continuously changing actions of the partner. This continuous mutual adaptation results in interactional synchrony to which both members contribute. Freely exchanging the role of imitator and model is a well-framed example of interactional synchrony resulting from a mutual behavioral negotiation. How the participants’ brain activity underlies this process is currently a question that hyperscanning recordings allow us to explore. In particular, it remains largely unknown to what extent oscillatory synchronization could emerge between two brains during social interaction. To explore this issue, 18 participants paired as 9 dyads were recorded with dual-video and dual-EEG setups while they were engaged in spontaneous imitation of hand movements. We measured interactional synchrony and the turn-taking between model and imitator. We discovered by the use of nonlinear techniques that states of interactional synchrony correlate with the emergence of an interbrain synchronizing network in the alpha-mu band between the right centroparietal regions. These regions have been suggested to play a pivotal role in social interaction. 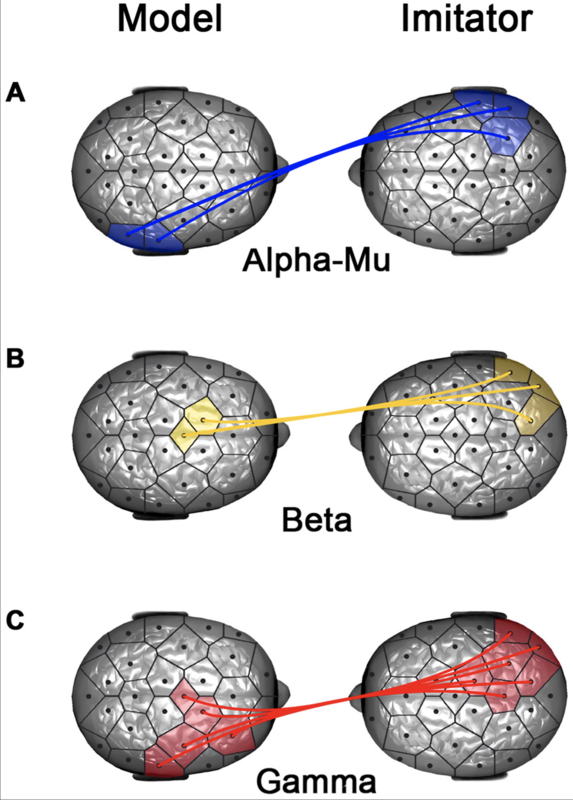 Here, they acted symmetrically as key functional hubs in the interindividual brainweb. Additionally, neural synchronization became asymmetrical in the higher frequency bands possibly reflecting a top-down modulation of the roles of model and imitator in the ongoing interaction.